Register for a Free Storm Shelter Door Color Upgrade! See the Storm Shelter in action! We have featured several Storm Shelter videos below to enhance your internet browsing experience for Storm Shelters. See the Granger ISS Storm Shelter go from it's manufacturing, assembly and quality control stages, to outperforming inferior Storm Shelter materials as it proves itself in durability tests against Fiberglass Storm Shelter cross sections. In the FEMA 320 Storm Shelter door testing video, the Granger ISS Storm Shelter's aluminum door passes the FEMA 320 specifications at Texas Tech University's Wind Science and Engineering Research lab! Granger ISS Polymer Door FEMA 320& FEMA 361 testing! 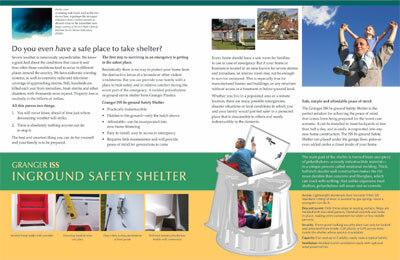 Protect your family with the longest lasting Storm Shelter on the market! The Granger ISS Storm Shelter will provide a safe place for your family for centuries to come! 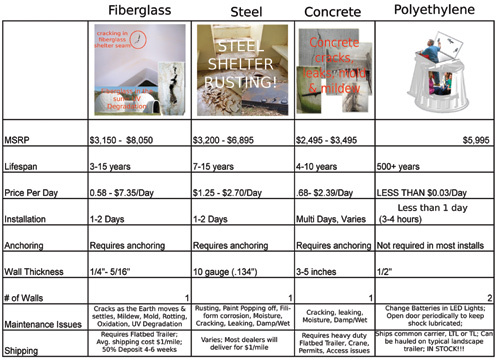 At a cost of less than 3 cents per day, see why the Storm Shelter by Granger Plastics is the best value! Our Storm Shelters are in stock! No deposit required with a long wait! No waiting 4-6 weeks to get your unit! Order today, your unit can ship today!